In the center there’s a series of concentric circles that evoke a graphic device used to induce a hypnotic trance through eye fixation. The rings in lime wedge serve as a tie-in to the mesmerizing circles. Also, actually seeing lime wedges at a bar will serve as a trigger to the ad’s suggestion. 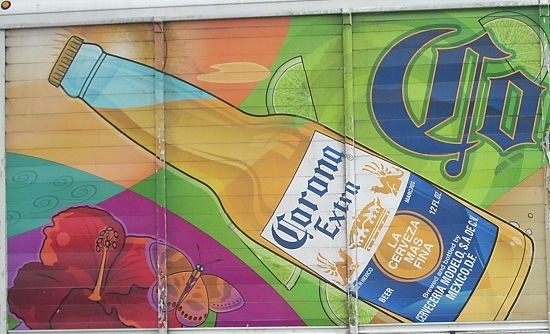 More conventional posters showing Corona with lime, as are likely to be found in a liquor store, will produce the same effect. The bottle contains the outline of a phallus. The complete graphic on the side of a delivery truck. No software “enhancements” or special lighting were appled to this or any of the other images at the Site. The graphics are actual ads, publicly installed and in use. A consumer digital camera is used and the pictures are taken from the street.